I sure hope this Christmas was a blessing for you. Mine truly was. We got to spend the holidays with our family. It was so wonderful. We had such a great visit with my parents, sister and our children and grandson. Time flew by of course. But we made the best of it. My hubs gave me a Light Pad for Christmas. 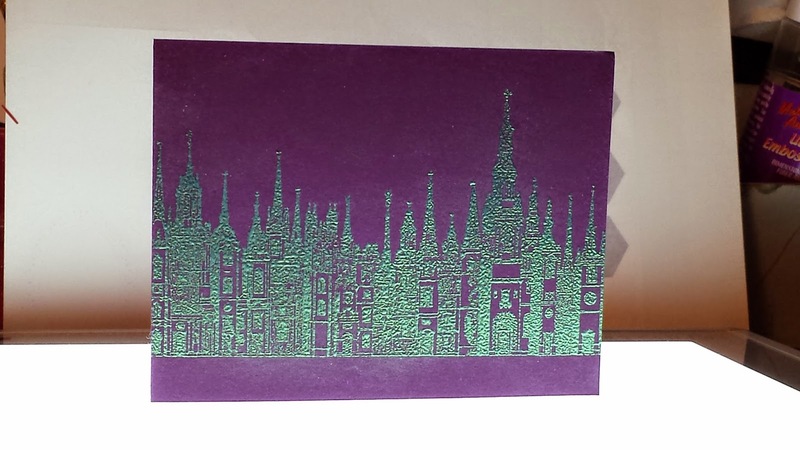 Here I used a deep purple cardstock and some Lindy's Stamp Gang Embossing Powder in Desert Moon Turquoise. I love Lindy's eb powders because they all have an iridescence to them. The photo was taken using my Light Pad. It was all totally an experiment. BUT, I love it! What did you get for Christmas? Was there 1 special gift that you like most? Or were they each a great gift? Thanks for peeping in today. I wish you a very Happy New Year 2015! May we all be blessed with health, wealth and happiness!